Have you ever had the occasion to look upon two lovelier little gals? That's me on the left. That's my cousin Vickie on the right. She posted this "brand new" picture on her blog a couple of days ago, and it filled me up with 36 varieties of nostalgia. Look at my little red zip-up jacket! It probably made that zzzt zzzt sound when my arms brushed up against my sides. I grew up with Vickie as one of my best friends. She lived a whole work-day's worth of driving away, but I spent the best month of every summer with her in Pennsylvania, starting at the age of 4. All it takes now is the smell of chlorine mixed with suntan oil mixed with fried pierogie (an infrequent occurrence, to be sure) and I'm right back there again. I'm stretched out on a soggy towel, listening to Elton John sing about cap feathers, wishing I could just be brave enough to open my eyes underwater. ...we're memorizing the back-to-school issue of Seventeen, thick as the Penney's catalog. We're licking ice cream cones. We're dancing in the basement. Now, well, we're old ladies. (That's surely what we would have thought back then.) Now we have real lives, problems that weigh on us for more than 30 minutes at a stretch. We have people who depend on us. We have God-delivered epiphanies. We have a choice, every day, and most days, we choose joy. Last night, I watched The September Issue with my girl Sarah. I was instantly swept into the hullabaloo of Anna Wintour and her deliciously enigmatic ego. I lamented, all over again, the celebrity overtaking of fashion mag covers, only to find out that she started it! That supermodel-obsessed era of my life? It's over, too. I never did make it to fashion week. I never made it anywhere, except for in my daydreams. Oh, and Toledo. I made it there. In one scene, a colleague describes Ms. Wintour's inability or refusal to look back. She is only forward-thinking, having no time or desire for nostalgia. I wonder if that's really true. I hope it's not. I hope it's all part of the brittle persona that put her on the map. I hope the brittle is at least partly fabricated. I hope that she secretly allows herself to feel the luscious ache for a simpler time. I hope she remembers exactly what her Summers used to smell like. I can't imagine me without a broad, fresh stroke of nostalgia. It's a covert time-machine, built for one. It takes me there and then zooms me right back here, to the place built mortar-and-brick with all of those yesterdays. Isn't it amazing how smells can flashback thoughts, places, and feelings. Geesh Coop Keeper you kill me! That's hilarious! Shannon, just in case you didn't see my Sunday comment - I "quoted" you in my blog post today - mentioned you because I loved your words. Shinny - you have some serious writing talents. Are you getting sick of being told so? Besides, I think you look like a supermodel. BUT, to me, the superest part of you is your heart. I'm so glad I knows ya. So, so, so so very glad. Every bit of Blogger frustration has been worth it. Every little bit. Even if you never make if further than Toledo I think you offer more inspiration than Ms. Wintour will ever be able to muster. I am a nostalgia-holic! I am always daydreaming about Halloweens and Christmases of days gone by. I miss walking to school in the fall and crunching the leaves under my feet. I miss glass soda bottles, my tiny hometown and how much kinder and calmer people seemed to be back then. Great post! I think I had a red jacket just like that! 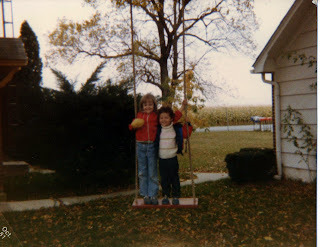 I remember the sound from my jacket and corduroy pants! Oh and Seventeen magazine. I think I had a subscription as soon as I had money for my mom to order it for me! Thanks for the flashback! Love the post. It brought back so memories of the times Vickie came to visit you in the summer. Look at you...tall you! I don't think I would give up the those super model dreams just yet. If you loved the september issue- you will love the movie about Valentino and the Marc Jacobs with Louis Vuitton- also if your a big project runaway fan- 11 minutes (about Jay McCarroll) rocks too!! A Coke, Seventeen magazine and Coppertone-SPF #2 (this was the 70's). Reminds me of those "teen" summers everytime! I remember when I actually got a subscription... great memories. Hiya, Super Fashion Patch Farmgirl! I STILL have my 1980's back-to-school issues of Seventeen. All that plaid made me...what? Swoonie! That, and Matt Dillon. Aren't great friends just great? P.S. I never made it Toledo. Wonderful post and I love the occasional strokes of nostalgia. It makes me happy to think of the good times and memories that were created. I'm inviting all of the people I follow over to my giveaway! Hope to see you there! Oh, those Back to School issues of Seventeen....that brings back memories! Let me first say, "Yes. I love the picture." Now, let me say that this post beckoned wild waves of nostalgia--having grown up in Pennsylvania where I slathered on coconut oil, sunbathed, and listened to Elton John to the point that I think all those commercials for products targeting damaged skin are produced solely for my benefit. And, yes, I've been to Toledo a time or two. And Jayme the Coop Keeper is right--you do have some serious writing talents!